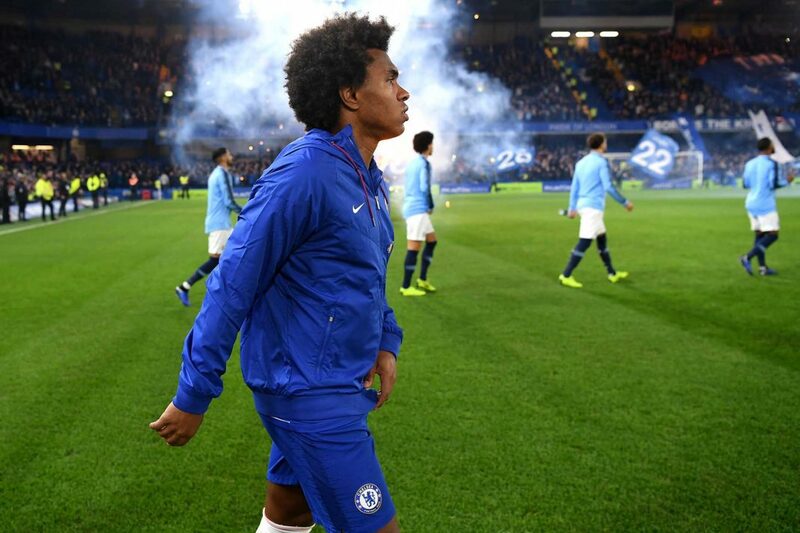 Willian walks onto the pitch prior to the Premier League match between Chelsea FC and Manchester City at Stamford Bridge on December 8, 2018 in London. Chelsea travel to the Etihad Stadium on Sunday to take on Manchester City in a pivotal match for both sides. These two teams met at Stamford Bridge back in December in a match that was billed as being between two contenders for the Premier League title. Chelsea won 2-0 on that day, but just two months later, Chelsea are in a much different place. Since that time, Chelsea hit a pretty rough patch of form. Rather than looking for results to keep them in contention for the Premier League title, they’re looking over their shoulder at Arsenal and Manchester United chasing them down for fourth place and the final Champions League qualification spot. A defeat Sunday could be very costly for Chelsea, given Manchester United’s current form. And despite a 5-0 win over Huddersfield last weekend, you get the sense that another bad result and bad performance, even against a side as talented as City, might just entice the board to act. But before that happens, there is a match to be played. Chelsea do have confidence after last weekend’s match against Huddersfield where Gonzalo Higuain scored his first two goals for Chelsea and Eden Hazard chipped in with a brace of his own. At times, the link-up play was very good between the pair of them, and Higuain does appear to be an upgrade over Alvaro Morata and Olivier Giroud in the finishing department. Finishing is one problem City don’t have at the moment. One key difference between this City team the City team that faced Chelsea in December is Sergio Aguero. Aguero missed the last match between these two, and in his absence, Raheem Sterling started up front and missed a bundle of chances in the first half that Aguero surely would have scored. For Chelsea, it’s much more a question of how the team approaches the match. Maurizio Sarri has insisted that he will maintain his system and style of play, and he hasn’t really proven otherwise. The question is more about how his players respond to the match. In recent defeats, Sarri has questioned his players’ motivation and lamented the fact that he didn’t see his style of play on display. In a way, he is right. In those matches, when the intial plan began to break down, the team began to lose their collective focus and unity. At times, it looked as if there were 10 strangers on the pitch all trying to focus on what they could do to win and sometimes ignoring if it really helped the team. Against City, there’s every chance that the initial plan isn’t going to work. It didn’t work in December when Chelsea abandoned Sarri’s pressing and possession-based system in favor of something a bit more direct and counter attacking. It’s highly unlikely Sarri will just set his side out with the intent of being less attacking, so it will be up to the players to adjust to the match conditions if they hope to win. If they don’t adjust correctly, Sunday’s score could be absolutely anything.